Dino Trails – The Dino Trails series reveals the latest dinosaur discoveries in Canada that are making headlines around the world and explains why these locations are famous. Meet world-famous paleontologist Philip J. Currie and learn how he is inspiring the next generation of fossil hunters in Dinosaur Provincial Park. Journey to the Royal Tyrrell Museum, where its collections are devoted to paleontology, and meet the dinosaur enthusiasts and paleontologists behind new fossil discoveries. Roam the wilds of southern Alberta with Wendy Sloboda, fossil hunter extraordinaire! Discover her methods and meet her greatest find, the Wendiceratops, in the Royal Ontario Museum. Discover dinosaur footprints in a coal mine in Grande Cache and meet the Pachyrhinosaurus in Grande Prairie. 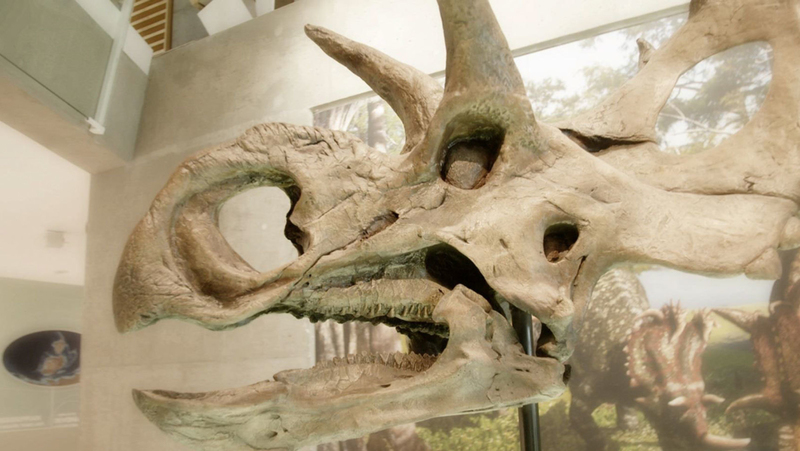 Learn northern Alberta’s fossil history at the new Philip J. Currie Dinosaur Museum. Journey to northern British Columbia to discover dinosaur footprints at the Six Peaks Dinosaur Track Site and see how new fossils are being uncovered in Tumbler Ridge.